Four militants were killed, a defence ministry spokesman told the BBC. A fifth was arrested. Islamic State (IS) militants claimed the assault. Taliban and IS attacks have soared this month, leaving scores dead. Marshal Fahim National Defense University is sometimes referred to as "Sandhurst in the Sand" as it is closely modelled on the British officer training academy. It has been attacked before. In October 2017, 15 military cadets were killed in an explosion outside it as they were leaving by minibus. That attack was attributed to the Taliban. How did Monday's attack unfold? Several explosions were heard, as well as small-arms fire, as the attack began at about 05:00 local time (00:30 GMT) at the military base in western Kabul. 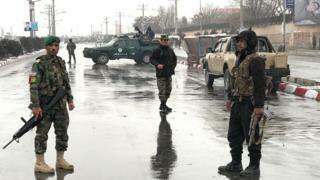 Two attackers blew themselves up, two others were killed by security forces and a fifth was arrested, defence ministry spokesman Gen Dawlat Waiziri told the BBC. Four AK-47 assault rifles, one suicide vest and one rocket-launcher were seized, he said. The president's spokesperson said none of the attackers had been able to get further than the first gate, Afghan news website Tolo reports. The attack was carried out by IS, according to the militant group's Amaq news outlet. However, it could also just be that the militants have decided attacking the capital is a more effective way of undermining confidence in the government and attracting international attention than trying to capture and retain territory in rural areas. The chief of the Afghan intelligence services said on Sunday he believed the upsurge in attacks was a response to increased US pressure on Pakistan. The US and Afghanistan accuse Pakistan of providing safe havens to militants and President Donald Trump recently suspended security aid to Islamabad. Pakistan has denied the claims. Whatever the reason, it is clear that violence in Kabul is on the rise. How bloody has the surge in attacks been? Apart from the ambulance bomb and the attack on the academy, an aid agency and a hotel have been targeted in the past week. In October, 176 people were killed in bomb attacks across Afghanistan in one week. The country's security forces in particular have suffered heavy casualties at the hands of the Taliban, who want to re-impose their strict version of Islamic law in the country. In May, 150 people were killed by a suicide bomb attack in Kabul. The Taliban denied any role, but the Afghan government says its affiliate, the Haqqani group, carried it out with support from Pakistan. How strong are the militants? The Taliban control large swathes of Afghanistan - but IS militants hold sway in a much smaller number of districts. However, both groups have demonstrated their ability to hit targets across the country. They have often come into conflict with each other, too.